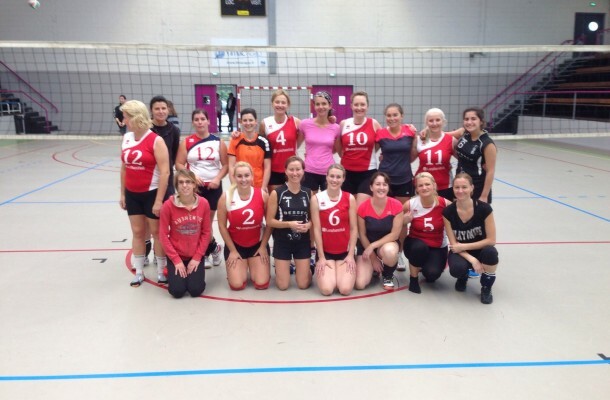 The Jersey Island ladies volleyball squad travelled to St Malo on Saturday in their first visit in a number of years to play against the French city team as they began their match preparations for next years Jersey Nat West Island Games. Whilst a few of the regular St Malo players who have played in the Jersey tournament in past years have now retired, the French team was still filled with experience and provide a good challenge for the Jersey ladies, as well as great hosts for the day. The game started in good form for the visitors as a delicate tip over the French block from Ilona Hutchins won the first point of the day. But the St Malo side were well drilled and it was not long before they had taken the lead and extended through some strong low hitting and attacking play at the net as the Jersey side struggle to come to terms with the quick attacks in their first competitive game of the season. Jersey were making a number of mistakes on their own service and this helped to give the St Malo side the first set 25-19. Jersey looked to fight back in the second set, but fell behind following a number of service reception errors as St Malo continued to apply the pressure. As the set edged on the French side increased their lead but the Jersey ladies were not going to give up this set easily, and with better first ball passes to setter Paula Hindley, they were able to edge back into the set with some good hiiting by Daniela Jakadova. Kasia Witzowska was blocking well at the net winning a number of points as the Jersey girls fought back to 24-24, but it was the St Malo team that managed to win the set 26-24. Jersey rang the changes again in the third set as team manager Steve Rowe utilised his full travelling squad to give them all experience against their hosts. Jersey again pushed their hosts close in the set and with Gemma Coles hitting well from the back court caused a few problems against the French ladies. However, they soon found themselves 20-13 down but following a time-out started to pull the points back to eventually lose the set 25-20. The fourth set saw much the same from the Jersey side as they struggled in the early parts of the set. With Deirdre de Rue’s on court encouragement and setting they again started to claw back the points, but again had given the French side too much of a lead. Renata Freitas was having to work hard on the back court as the St Malo ladies kept up the strong and accurate hitting. And despite a couple of well placed attacks from Marta Kowalczewska, it was the French side that won the set 25-20 again. In the fifth set Jersey changed their line up again with a couple of players being asked to play out of rotation to enable everyone to have some part in the match. However, the set was to be cut short, with St Malo leading 15-10 Ilona Hutchins went up to block only to turning her ankle badly on landing. With her needing attention on court, it was agreed by both teams to end the match then. Steve also paid thanks to their hosts St Malo ladies for their hospitality and transportation to and from the harbour, and also to Condor Ferries for providing wheelchair assistance on both sides of the water for our injured player.